Written by Nicholas Owsley, research team Jennifer Adhiambo, Esther Owelle, Irene Ngina, Suleiman Amanela. Behavioral Economics as a field has grown out of the discovery of several core ‘biases’, many of which were identified in the early 1970s by Nobel Laureate Daniel Kahneman and his co-author Amos Tversky. These biases are identified as a systematic pattern of thinking which deviate from formal logic and influence our judgement and decision-making. Their pioneering work helped to demonstrate that, unlike the neoclassical model of economic decision-making suggests, we, as humans are not rational: we are biased. This discovery, along with numerous additional cognitive biases identified by others since, has formed the backbone of this multidisciplinary field, not to mention the outline of many a pop-science book (Blink, Thinking Fast and Slow, The Power of Habit, etc). As a Behavioral Science research organisation, we know that context (environment, culture, framing, etc) greatly influences behavior. So how does the context of this research affect the results? The significant majority of work in this field has historically been conducted on a narrow group of people. Arnett (2009) shows that 96% of top psychology findings were conducted on Western samples, more specifically from a subject pool of individuals from Western, Educated, Industrialised, Rich and Democratic (WEIRD) societies (and usually from the top echelons therein). With African samples accounting for a meagre 0.002%, the universality of these findings can be called into question. At Busara Center, we believe that only by locally embedding ourselves within a specific context can we build behaviorally-informed solutions. This has formed the basis of our mission, to advance and apply Behavioral Science in pursuit of poverty alleviation, and we do this from our headquarters in Nairobi, Kenya, as well as our offices across the African continent. In 2016 we ran the exact same studies as designed by Kahneman & Tversky in the early 1970s with Kenyan nationals, to understand how biases differ across cultures. What was immediately apparent from our 2016 study was that comprehension was low. Frankly, it doesn’t take a (Behavioral) Scientist to understand why! The measure for one of the biases, the ‘Decoy Effect’ asks Kibera residents, a low-income neighbourhood in Nairobi, to make a purchasing decision on different subscriptions to “The Economist” magazine. The subscription amount is three times greater than their average monthly wage. Another measure asks respondents to select the statement most likely to characterize Linda, 31 years old, single, outspoken and a philosophy major who participated in anti-nuclear demonstrations… Not exactly a standard profile you would meet in Kenya. And, if the examples are not recognizable, the hypothesized psychological processes are not engaged because the decision is so different, making our results “null”. Having identified the three most problematic biases in the 2016 study regarding comprehension, we set out to contextualise them, adjusting elements of the problems to make them recognizable while maintaining the key psychological components of the original problems. To test whether results substantially differ between the original measure and the contextual measure, field staff surveyed 409 respondents from the Kibera informal settlement (the same population group as the Kenyan low-income group from the 2016 study) using tablets to collect data. Respondents were randomly assigned to either the contextualised or original version of each measure at the individual-measure level. For all three measures, there were no significant differences in ‘bias’ (our key outcome) between the contextualized and original versions. 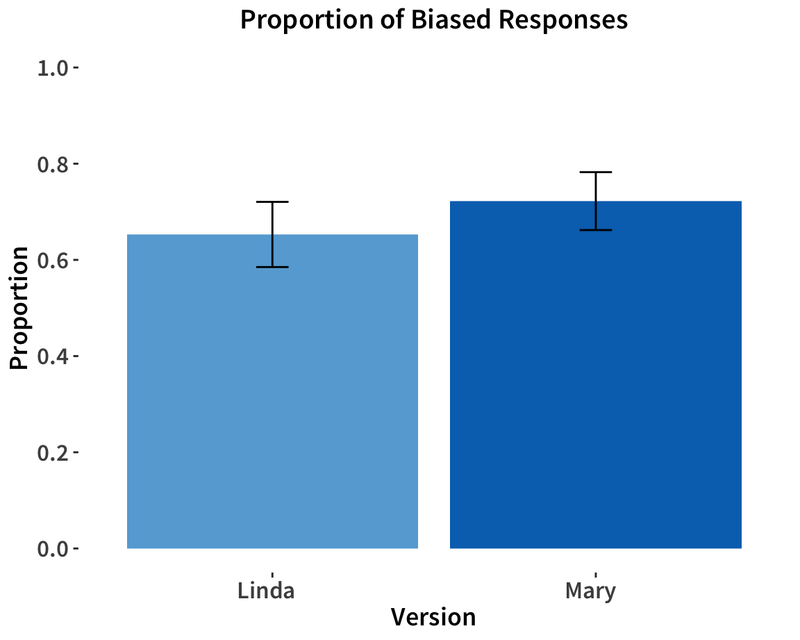 However, for the Linda-Mary Problem and the Decoy Effect, the contextualized versions showed significant reductions in ‘unusual’ response patterns, suggesting that these measures worked better. Taken together, the results suggests that adjusting measures and accompanying explanations to the local context can produce important gains in comprehension, and produce better quality findings. 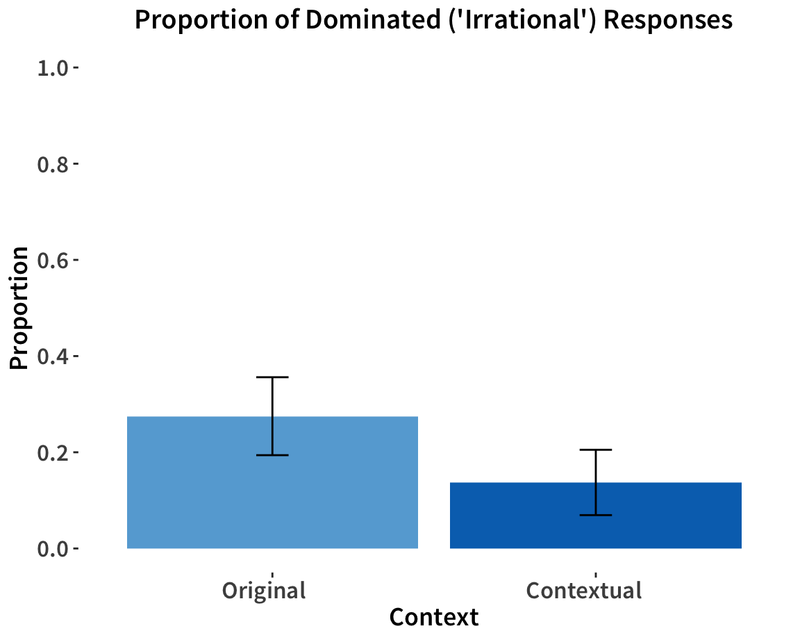 From these findings, Low-income Kenyans indeed seem more ‘rational’ in both moral reasoning and the effect of a decoy than typical WEIRD samples, but similarly prone to the ‘Representativeness Heuristic’ in the Linda-Mary Problem. Given the findings of limited bias, and the persistent selection of the decoy even in the contextualised version of this measure, it might be useful to next develop measures that are not simply contextualised versions of Western studies, but that develop entirely Kenyan versions of the measures of these underlying psychological mechanisms. Thinking even further afield, for this group, we might simply be looking at the wrong biases entirely. For more exclusive content, access to the latest findings from research and insights from news and trends, sign up to our newsletter here!